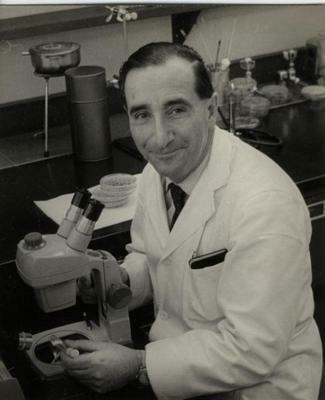 Guido Pontecorvo’s research focused on the use of micro-organisms to probe fundamental mechanisms of heredity, especially the structure and function of the gene. "in no area of biology have ideas arisen so often in advance of times as in genetics or its offshoot, molecular biology." Research with a small group of students and associates resulted in the development of the ascomycete fungus Aspergillus nidulans as a convenient genetical tool. Now a 'model' organism, mutated 'Glasgow' strains of A. nidulans are employed in genetical research world-wide and the genome of the starting strain has been sequenced. One important outcome of this work was the establishment with Alan Roper of the Parasexual Cycle, asexual reproduction, in fungi. 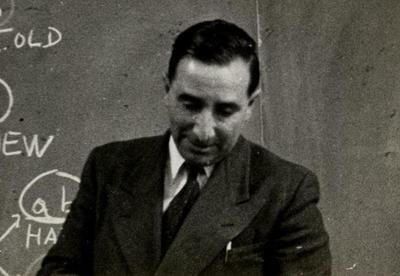 Guido Pontecorvo (1907-1999), who liked to be known by his nickname, Ponte, was the University's first Professor of Genetics, 1955 to 1968, and has been described as "one of the founding fathers of modern genetics". 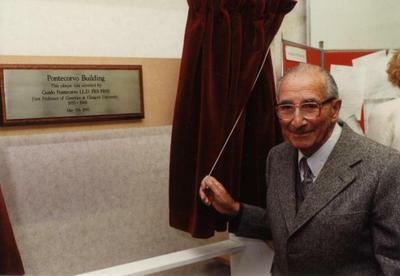 He endowed prizes and scholarships for students at the University and the Genetics Building was named for him in 1995. 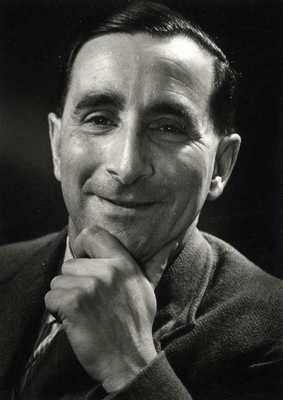 Born and educated in Pisa, Pontecorvo was forced to leave Italy in 1938 and settled in Scotland. He was appointed a lecturer in Genetics at the University's Zoology Department in 1945, and a new department was set up in the Anatomy laboratories of the Anderson College building soon afterwards. 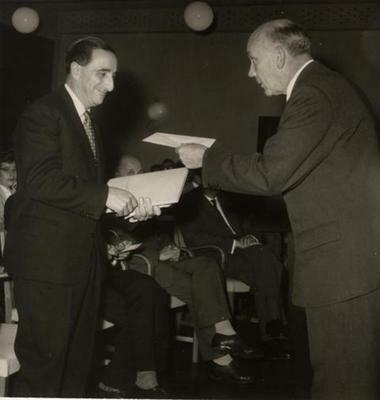 He became a Reader in 1952, three years before his appointment to the new Chair. He left Glasgow in 1968 to take a post at the Imperial Cancer Research Fund's laboratories in London. Pontecorvo was one of the leading figures of his day in the study of cell genetics. He was the founder of the genetics of Aspergillus nidulans, a relative of Penicillium, and originated genetical studies in many other fungi. He elucidated the divisibility of the gene by recombination, and after leaving Glasgow he carried out important research in the application of parasexual techniques to mammalian cell cultures. 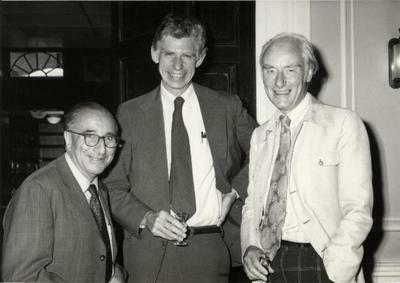 For more information relating to the papers of Guido Pontecorvo, please visit The Wellcome Digital Library site Codebreakers: Makers of Modern Genetics. Cohen, Bernard . 2007. Guido Pontecorvo (“Ponte”): a centenary memoir. Genetics. 177; 1439-44. Pontecorvo, G., J. 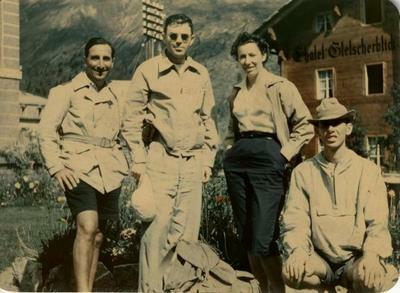 A. Roper, L. M. Hemmons, K. D. Macdonald and A. W. J. Bufton. 1953. The genetics of Aspergillus nidulans. Advances in Genetics. 5: 141–238. World Changing Project, "Establishing the fungus Aspergillus nidulans as a convenient genetical tool," in University of Glasgow World Changing (University of Glasgow, 2010); http://www.worldchanging.glasgow.ac.uk/article/?id=80 (accessed April 24, 2019). World Changing Project. "Establishing the fungus Aspergillus nidulans as a convenient genetical tool." In University of Glasgow World Changing. University of Glasgow, 2010. http://www.worldchanging.glasgow.ac.uk/article/?id=80 (accessed April 24, 2019). World Changing Project. "Establishing the fungus Aspergillus nidulans as a convenient genetical tool." University of Glasgow World Changing. University of Glasgow, 2010. 24 April 2019 <http://www.worldchanging.glasgow.ac.uk/article/?id=80>.